Charlotte and Larry have a beautiful home in the Mt. Vista area of north Vancouver, WA. They purchased their new, two story spec home in 1997. They saw it and immediately fell in love with the house and the fact that it backs up to a natural wildlife corridor. Their first home remodel was to completely renovate an upstairs master bath in 2008. The home remodel project was inspired by a leaky jacuzzi style tub. Charlotte and Larry contacted three remodelers obtained from their local phone book. After interviewing the candidates, they selected Designers Northwest because of the impression they were left with by owner Mike Kinnaman. “We knew instantly that he was going to be our professional home remodeler,” says Charlotte. Mike worked with the couple to design a new master bath. A wall section was removed and then replaced with beautiful block glass partially enclosing an oversized walk in shower, accented with custom tile. The new shower was built in the corner where the jacuzzi sat. Mike took advantage of two existing skylights which now filter light through the block glass, creating an upscale look. A prefabricated shower was replaced with an updated tub. The new master bath has a spacious look and feel that was absent before the project. After experiencing such a dramatic difference with their bath remodel, Charlotte convinced Larry that her kitchen needed an upgrade. Charlotte wanted new granite countertops, new appliances and an upscale kitchen sink. They called Mike back in 2009 to complete the project. He suggested adding pendant lights and designed an extended bar area that improves the entertaining functionality of the kitchen. “We love this new space,” says Charlotte. 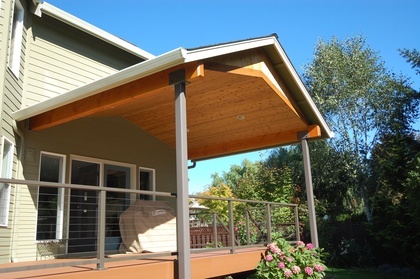 A year later, Charlotte and Larry hired Mike again for a home remodel project; this time to build a new cover over their private back yard deck. The result is stunning. Large fir beams and a plank cedar board ceiling offers a spacious and rustic northwest feel to the new outdoor living space. “Now I can have Larry barbecue all year long without standing in the rain,” joked Charlotte!